This variance calculator and simulator for poker is handy and easy to use. Just enter your winrate, standard deviation and the amount of hands to simulate. You'll most certainly get insightful results.Read below how to use this simulator. Winnings in BB on right axis, current downswing in BB on left axis. Depending on the number of hands displayed, the extent and number of downswings may be underrepresented due to the resolution of the graph. How to use my Poker Variance Calculator? This section will explain how the calculator works and what the numbers and charts mean. Hop over to the Variance Calculator page and enter your winrate, standard deviation and the number of hands you want to simulate. You can ignore the field observed winrate, we'll get to its purpose later. Once you have entered the data, hit Calculate and the let the Calculator do its magic. The first thing the Variance Calculator does, is to run 20 samples over the amount of hands, winrate and standard deviation specified. It'll also calculate the expected winnings over the amount of hands. This number will appear as a rather boring straight and black line in the graph. Thirdly the calculator displays the 70% and 95% confidence intervals as light and dark green curves. What you need to know about them is that at any given time your winnings will be within these intervals with a probability of 70% and 95% respectively. They basically show, how much variance you should expect to see. Standard deviation after X hands: This number shows by how much your actual results will differ from the expected results on average. The first number shows the absolute value, the second translates this number into BB/100, showing the impact on your winrate. 70% confidence interval: Your actual results over the simulated amount of hands will be within this interval 70% of the time. The first interval shows absolute numbers, the second translates those into BB/100, showing the 70% confidence interval for your winrate. 95% confidence interval: Same as the above with 95% certainty. Meaning: 19 out 20 times your actual winnings will be within this interval. Probability of loss after X hands: probability that you will experience negative winnings (meaning: losses) over the amount of hands. Probability of running at or above observed win rate …: If you entered an observed winrate, this number will show you the probability that you will experience a run at or above this winrate over the amount of hands. 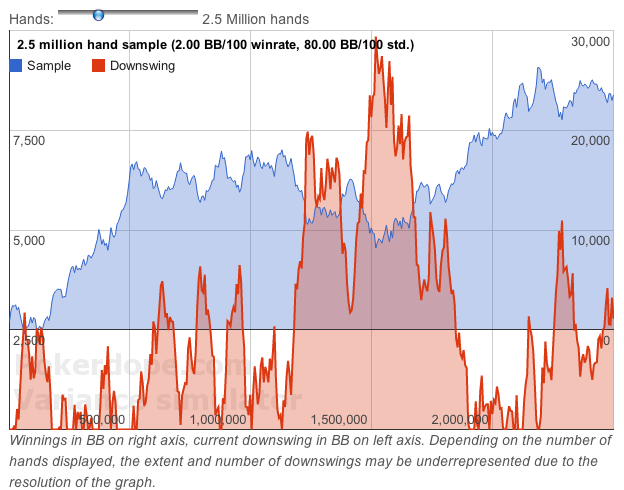 Probability of running below observed win rate …: Same as above – probability that you will experience a run below the observed winrate over the amount of hands. This chart simulates a single run over 100 thousand up to 10 million hands with the winrate and standard deviation entered above. You can choose how many hands to simulate by moving the slider. Apart from showing a single sample, this graph also shows some insightful information about downswings. The red area shows for any given point, how much the sample is currently away from its previous peak, meaning it tracks downswings. This chart uses two vertical axes. While the sample winnings have their scale on the right axis, the downswing tracker has its scale on the left axis. In this example the simulated player ended up with winnings over 25,000 big blinds after 2.5 million hands but had to deal with a nasty downswing of almost 10,000 big blinds between hand 1.2 million and hand 2 million. The last section of the Variance Calculator sheds some more light on potential downswings. Therefor 100 million hands are simulated and all downswings over this simulation are tracked.The first table shows the extents of downswings. It shows how often the simulated player was stuck in a downswing of at least X big blinds. For example (1000+ BB – 31.77%) means the player was in the middle of a downswing of at least 1,000 big blinds 31.77 percent of the time.The second table shows how long downswings last on average. For example (50000+ Hands – 15.81%) means the simulated player was in a downswing over at least 50,000 hands 15.81 percent of the time. For the purpose of these calculations a downswing is defined as any period where the current total winnings are below the maximum previous total winnings. Meaning, by this definition a downswing is not over until the player has fully recovered its losses. Should you have any questions, encounter any errors or have ideas for improvements, please let me know. the number of tables change the results of the calculator? for how many tables is calculated the variance on this site? What about rake and fee? Is it calculated? Yes. The rake is already considered in the win rate. Your win rate should always be after the rake. Hello, how identify “Winrate in BB / 100”? “Winrate / 100” means how much you win over the course of 100 hands statistically. Winnings are measured in big blinds. Lets say you’ve played 10,000 hands of $1 / $2 NLH and won $500. That means you have won 250 big blinds over 10,000 hands. This is equal to 2.5 big blinds per 100 hands. How do you calculate standard deviation after X hands? Btw, industry standard is to use BB to describe “big bets” and bb to describe (big blinds). Everything is super misleading. do i need to use ev adjusted winrate or winnings winrate? i am asking cause i am running way above ev at the moment. Hi, using your adjusted winrate makes the results more accurate. hi, can you explain me? Special Note: It has been pointed out to me by Bruce Zastera, one of the most knowledgeable posters on our forums at http://www.twoplustwo.com, that it is also possible to go broke before reaching the number of hours at which we evaluate the probability of a loss, as well as after that time, and this problem is more acute at the 95 percent level than I originally realized. This means that these tables are significantly underestimating by a factor of about 2 the amount of bankroll needed to only have a 5 percent chance of going broke. Fortunately, this problem mitigates as the probability of going broke is reduced. Thus the Bankroll Required to Assure a Win tables do contain solid estimates and produce a risk of ruin of approximately 1.1 percent, but the 95 percent tables should probably not be used. Of course I didn’t forget that note. I wrote some of it. It in no way changes the fact that the calculations in that section are no way to compute the bankroll requirement for a desired risk of ruin. That’s because the number of sigmas in your derivation does not translate to a probability of ruin, for the same reason that the 95% confidence interval in this blog has nothing to do with a 5% risk of ruin. Moreover, this fundamental problem does not “mitigate as the probability of going broke is reduced”. Your computation for the “bankroll required to assure a win” ignores 88% of the possible ways we can go broke. That number gets worse as the risk of ruin is reduced. I’m sure you understand that a mathematical model should capture the dominant effects rather than ignoring the dominant effect. We need to be clear what was meant by “the problem mitigates as the probability of going broke is reduced”. The bankroll needed for a 5% risk of ruin is about 2.2 times the bankroll that your method would compute. If we want a 1% risk of ruin, the bankroll required is about 2 times what your method would compute. If we want a 0.13% risk of ruin, the bankroll required would be about 1.5 times what your method would compute. That’s about as small a risk of ruin as most people would care about, yet the bankroll is still off significantly. There’s not a lot of mitigation. The actual risk of ruin produced by your bankroll in that last case, which you describe as “the bankroll required to assure a win”, would be about 1.1%, not 0.13%. The mitigating factor is that both of those numbers are relatively small. Lots of folks may not care if their risk of ruin is 1.1% or 0.13%, though I’m not sure everyone would describe a 1.1% risk of ruin as having assured a win. The 0.13% came from 3 standard deviations. You chose that as a way to include essentially all of a population as is common in statistics. Except you are considering the wrong population. We don’t want the population of positive results at a particular point in time assuming we can play through any draw down. We want the population of all random walks that never go broke. Using the former population for bankroll requirements and risk of ruin is mathematical nonsense. BTW, the formula Pokerdope posted was well known long before Mathematics of Poker by Chen and Ankenman. It has been discussed by many at 2+2 since I introduced it there in the early 2000s or possibly even the late 1990s. It also appears in Douglas Zare’s poker book. Before that it was well known to the blackjack community, having appeared in papers by George C. and Patrick Sileo in 1989 and 1990 respectively . It was surely known in mathematics before that as the general expression is important in financial math, and it can also be obtained from the Weiner process. Deriving it from scratch isn’t that hard, but if you want a rigorous examination of the conditions under which it applies and how to modify it when those conditions don’t apply, see the essay “Gambler’s Ruin Revisited” in the book Optimal Play. There is also an analytical short term ruin formula for risk of ruin in a finite number of hands. I’ve only recently found a derivation of that one, and it is quite involved but still fairly accessible. Of course it’s quite straightforward to simulate these results to verify the accuracy of the formulas under a variety of conditions. It’s good to see you back in these type of discussions. It’s a shame we don’t get to see more of your input as we once did. The confidence intervals in his graph have nothing to do with risk of ruin. His graph is showing you a range of results assuming you can play through any drawdowns. IOW, if you lose your 5991 at some point, you can still keep playing, as if someone lent you additional funds. The positive portion of the graph includes the times you lost your bankroll and then recovered to finish positive. The risk of ruin formula as correctly given by Pokerdope counts these instances as a failure. A risk of ruin formula is not and cannot be based on confidence intervals. BTW, we developed a similar variance calculator on your site for tournaments which requires a different approach to risk of ruin.. It doesn’t have a web interface as of yet. It runs in R which is a platform for statistical computing which free and very easy to install. Here is a link to the script. along with some separate textual output including both analytical and simulated statistics. Thank you for answering my question. But since you’re showing a 95 percent confidence interval, aren’t you actually showing a graph that would correspond with a 2.5 percent risk of ruin while you’re using a formula that calculates a 5 percent risk of ruin? Put another way, wouldn’t a 90 percent confidence interval be the correct interval to use instead of the 95 percent confidence interval since 5 percent of the time your result will be above the confidence interval (and here you don’t care about bankroll since you’re such a big winner) but on the other hand, 5 percent of the time your result will be below the interval and that is what you’re interested in,. 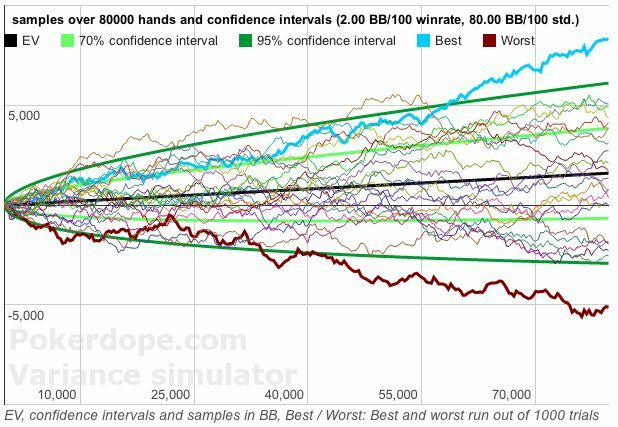 In your example of a 2.5 BB winrate per 100 hands and a standard deviation of 100 BB per 100 hands how did you calculate (or estimate) the Minimum bankroll for less than 5% risk of ruin (»?«) to be 5991 BB. Also, since this is a 95 percent confidence interval with both an upside and a downside, aren’t you actually calculating a 2.5 percent risk of ruin since 2.5 percent of the time you can do better than the upper limit results (and now you won’t care about your bankroll requirements) which leaves only 2.5 percent for the downside? That is if you want to calculate a 5 percent risk of ruin, don’t you want to use a 90 percent confidence interval and not a 95 percent confidence interval? The risk of ruin and the necessary bankroll is calculated independently from the confidence interval. and which matches the minimum bankroll given in the example. How do I speak to the owners of this site? Do you have sophisticated guesses for the STD of 6-max five-card Omaha? Maybe something like 200? This is misleading, but in the 20 samples graph, the best and worst are run out of 1000 trials. How do you define ‘Risk of Ruin’? Presumable it’s the probability that a player loses there entire roll if they played the same stake and didn’t drop down? If so how do you calculate ROR if they move down the stakes? Paul, it’s you and me buddy. This is cash all in pre since 11/29. 20 graphs, 1 should be over that 95% line sometimes right.. but not always. How are the graphs calculated? just a std deviation calculation or something else? How does run it twice affect this? is there any way to account for it? for example my winrate in Pokertracker Big Blinds (PTBB) is 3 then i have to use the calculator with 6 BB/100??? Q: Do you have any idea how awesome you are for putting this up for people? A: All the way awesome. Firstly note that the HM filter “Allin Preflop”=True is really “Got Allin With Someone Preflop” – 100% of these went to showdown (try adding “Hero saw flop”=False and note there are now zero hands). So the EV you used does not include the folds you get when you shoved (otherwise you’d probably be making > 100 bb/100 EV). With that caveat aside, as far as I can tell the numbers you used for EV and SD look reasonable (a 35%ish edge when getting it all in sounds about right for the ever-short-stacked hypers). I don’t play many hyper STTs, mostly MTTs; my raw numbers using “Allin Preflop”=True are 7.5K hands @ 130.58 EV (134.08) with SD 219.30. To get it slightly more in line with a hyper stt bubble environment I filtered “Stack” < 25BB and only co/btn/sb/bb and my numbers were 3.5K hands @ 75.19 EV (69.92) with SD 115.26 – both my actual rates are well within the 70% confidence intervals. Denis – It’s not a bug, no. The 100% confidence interval would be the range all the way from losing every hand to winning every hand, which is as wide as it could get – you can be 100% confident that a trial will net something in that range. An expected 5% of trials will net outside the bounds of the 95% interval; an expected 30% of trials will net outside the bounds of the 70% interval. Could someone please explain how could it be possible that 95% confidence interval is wider than 70% ? Is this a bug? What is the observed winrate? if thats true that means the numbers of pokerdope are wrong isn’t it? anyone can explain what observed winrate is? We have winrate and observed winrate, any differences? The variance calc is complete non sense. It would be correct if online poker would work with correct and real life daily math, but since it doesnt, any calculation is a fail. The numbers, u refer to only make sense if you entered an observed winrate. If your ture winrate is 2.5bb/100 then it is very unlikely you will run 10bb/100 (which is the observed winrate) over 100000 hands. if you chose the same winrates for the true and the observed winrate, then you will see, that it is 50%. Hi Mitch, these is the complete overview of my calculations. (2,5 bb winrate, 10bb observed winrate, 100K hands, and 160 bb standard dev (PLO)). can anyone tell me why it is statistically more likely to run BELOW EV than it is to run ABOVE/EQUAL TO EV??? Wow if someone could explain this to me I would be very grateful, right now I do not understand why it would be MORE likely to run below EV than at/above EV? Especially since, even though I am a small winner in my games, I am perpetually running below EV and my actual winnings should be much higher than they currently are. Thank you. Hi. How do you simulate the samples and how do you calculate the “confidence intervall”? Do you assume normal distribution? Can anybody please explain to me why (if I interpreted the stats below correctly) it is more likely to run below EV (93,1)% than above/equal to EV (6,9%)over 100k hands? I always see people on the forums : ) say it is as likely to run below EV or above EV but this says otherwise. Help explaining this would be greatly appreciated. Look, Andrey, you may start playing with your Min BR of 14979 with 5% risk of ruin at a certain distance, but the more you play there is the bigger chance to have a downswing of 15k bb. You see, those tables were simulated at the distance over 100 mil hands. So the smaller is your sample the less chance for you will be to ruin. Could anybody explain me.. If I see this: Minimum bankroll for less than 5% risk of ruin (»?«)-14979 BB. Do I understand right, when think, that I can lose my 14979 bankroll with a probability of 5%? Then how can it be, that Downswing Extents : 15000+ BB	30.82% ? Id say, losing 150bi bankroll with 5% prob assumes u get 150+ downswing at the very beginning of your journey. bb means – Big Blinds and BB means Big Bets – standard abbreviation. Also HM2 has 2 different stats for std dev. One is bb per 100 hands and is as in examples. Another is just std dev. So the difference is like, eg, for midstack nlhe 65 vs 6.5. You may put in the description than you use std dev per 100 hands. Also a qustsion: “Minimum bankroll for less than 5% risk of ruin” – does it mean that a player continues to play the same limit up to the end or that he goes down the limit at some point (eg, then he has the same amount of bb left for a lower limit)? But nothing changes if you treat it as Big Bets though. Hello! Awesome calculator! Are the BBs big bets or big blinds? Was not sure about that. Hi Guys, any help for winrate in BB/100. Is it big blinds or big bets? The SD / 100 for 5BB cap games is has to be lower than 50 big blinds / 100 hands mathematically. Depending on your play style, you should have a standard deviation between 15 BB/100 (fewish all-ins with showdowns) and 25 BB / 100 (lots of of all-ins with showdowns). How can i figure out standard deviations for non-standard games? There’s a 5bb game I’ve been playing recently, and I think the standard deviations should be insane. I set the parameters for 250, what do you think they should be? First off this is excellent and clean! I am starting a computer science minor next semester, although I’ve already begun to learn about c and java on my own, and was curious as to how you wrote this application. Like what language you used and what sort of things went into making this. I’d really appreciate any thing you could tell me. Thanks for the variance simulator. am a Mental Game Coach in the poker industry. I currently am sending my Mental Game Coaching clients over to this website to learn about the true effect of variance in their game. I believe if people used the simulator above and we’re more able to understand how much variance will affect their results, some issues of Tilt will be resolved.